Tip: Use a small brush and watercolors to make your own journalingcard. Everyone can make a messy line, right?! Tip: For easy journaling, use the Currently list! Tip: The app InstaWeather has several different layouts and this very simple and clean one is easy on the eyes. Tip: Include something you shopped and loved! I was one of the lucky ones to get my hands on one of Elise´s wooden amersands that was her item of April! 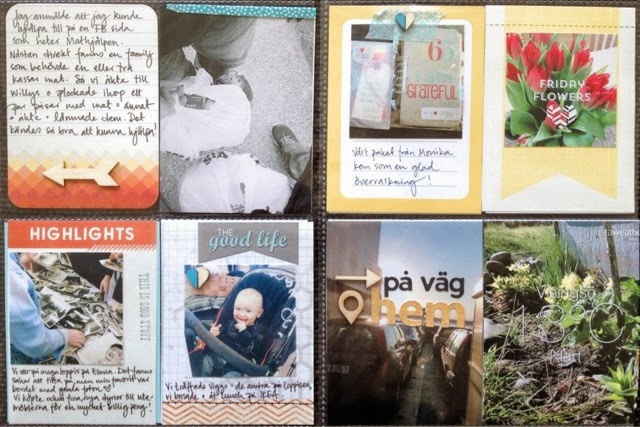 Tip: Journaling made easy? Just list it! Tip: Include cute photos of your nephew that your sister posts on social media! Here´s to having 118 weeks of life shared here through Project Life!